Impossible you say? I certainly thought so. 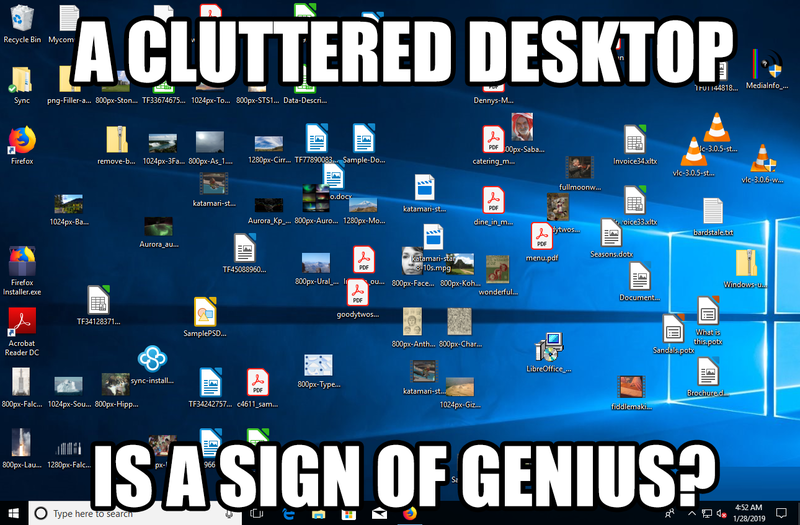 For many years, my own attempts to tidy up the piles and piles of neglected files and folders scattered across my computer simply resulted in even more clutter. My files were the proverbial haystack, and the needle was long gone. It wasn’t until I took a drastically different approach to file organization that I discovered the secret to success. Trash first. Then organize categorically, comprehensively, all in one shot. Do not pass go until your desktop is absolutely clean and spotless. Tidying up a few derelict files per day just won’t cut it. You’ll need to take a more extreme approach to regain control. And when it’s all said and done your files will be organized, easy to find and a pleasure to browse. Order in your life will be restored. The average personal computer is host to over 200,000 files, and by some estimates our computers are accruing 10,000+ files each and every year. These files can take many forms: photos saved from your mobile devices, music, videos, customer and client files, documents, email attachments, downloads, spreadsheets, notes, and of course, system files. We’re saving every file because we think that some day they might be of use again. This mind-set is correct to a degree, as you certainly don’t want to trash a file with emotional value. But at some point saving becomes hoarding and it becomes impossible to tidy up just a little bit at a time. Start with a discards folder. The easiest way to start your path towards file bliss is to create a folder for files that you no longer use on a regular basis. You can name this folder “Archive” or “Discards”. Here you should move in files that you suspect are no longer needed. Don’t panic! At this point you’re not actually deleting files, rather, you are sequestering them for further review. One folder to rule them all. Now that you’ve got your unwanted files out of the way it’s time to decide on a place to put your very precious files and folders. The My Documents folder is a perennial favourite for this task, however, to keep things as clean and tidy as possible, it’s best to create a brand new folder to house your files. You can name the folder My files, or in my case, because I’ve been using Sync.com to keep my files backed up, I named the folder Sync. 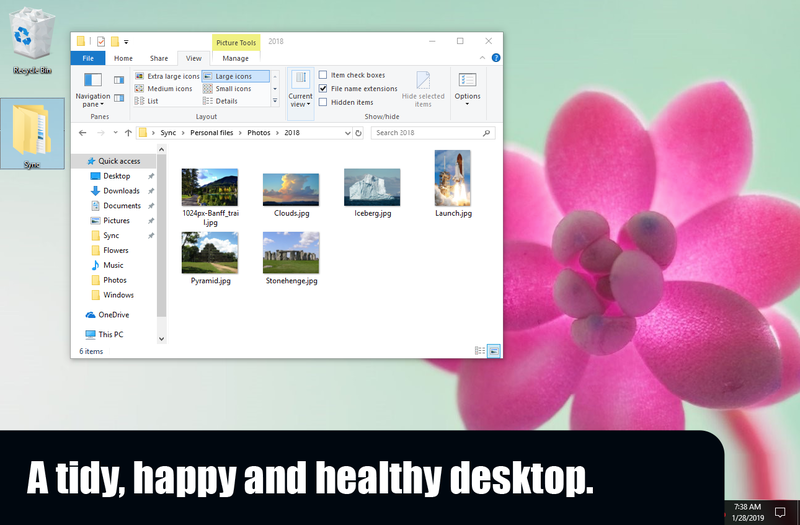 For best results place your new folder directly on your desktop. This will be the new home for your dearest, most important files. You can get there quickly, because it’s right on your desktop. Home is where the heart is. If you’re like me, you’ve probably got piles and piles of files on your desktop, in your downloads folder, in your My Documents folder, and strewn about here, there, and everywhere – with nary a folder in sight! But I’ve got news for you: the key to organizing your files categorically and comprehensively is to create folders. If you’ve been following along then you’ve already created two new folders (a discard folder, and a shiny new home folder). It’s time to create some more. 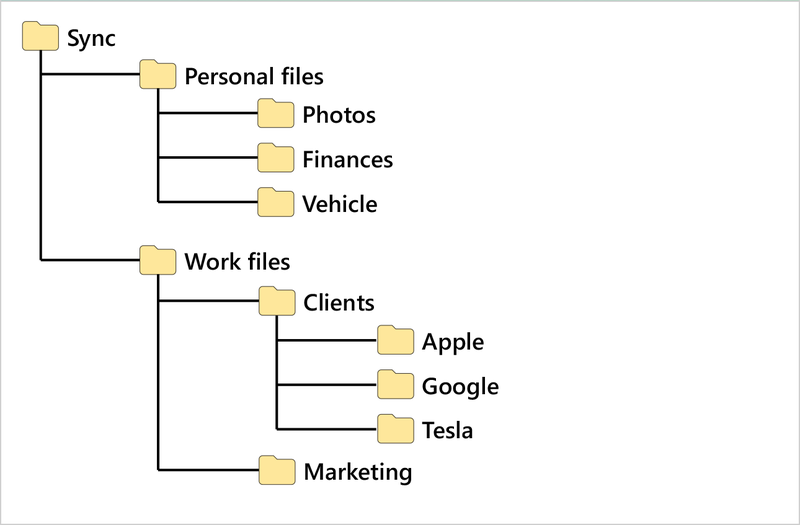 The easiest way to organize your files is by category. 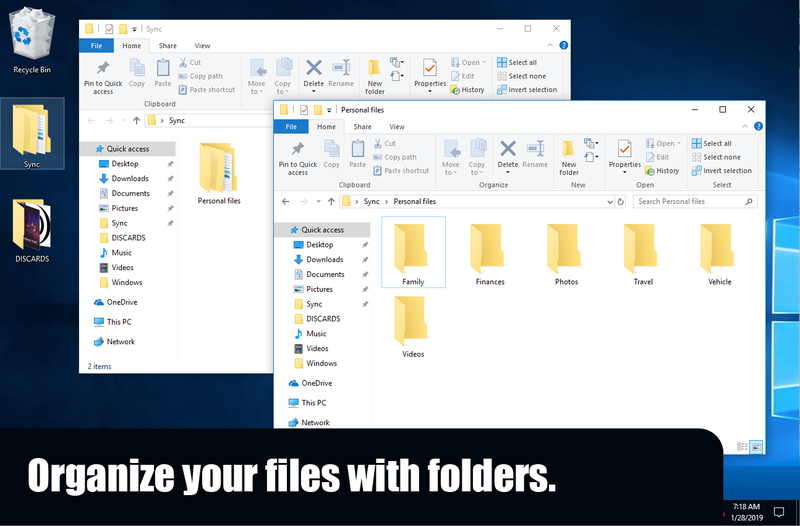 For example, if you use your computer for both personal files and business files you might start by creating a folder named “Personal files”, and another folder named “Work files”. Remember, you want to create these folders inside your newly created home folder. For your personal files, popular categories destined to be folders may include: Photos, Videos, Documents, Finances, Family, Projects, Travel, Purchases, Email Attachments, Vehicle, Employment. For business files you should consider categories such as: Clients, Team, Marketing, Admin, HR, Product, Strategy, Proposals, Company Letterhead, and depending on your own business requirements, a whole lot more. Don’t limit yourself to just these categories. Follow your intuition. Only you know your files best. Don’t be afraid to create sub-folders inside each of your new folders. For example, if you create a Photos folder, you might want to create a sub folder for each Year, or a sub folder for each Album. 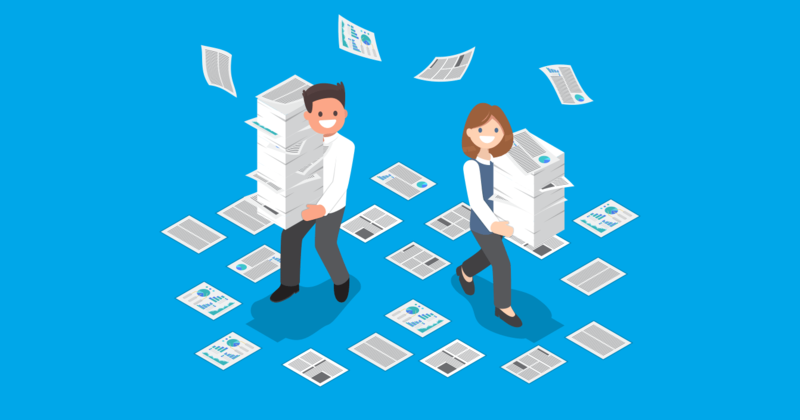 When organizing your business files, it’s common to create separate sub folders to organize by Date, Client Name, Project, Department, Shared Files and more. Strive for perfection, but remember – you can change your folders up at any time. Tidying is an ever evolving process of trial and error, as is life. The key to success is organizing everything, all in one shot. Once you get started you’ll need to follow through until your file pile has vanished. Tidying up a little bit at a time will only result in even more clutter. You’ve got to change your mind-set and stay the course until the very end. Continue to move files into your new folders, create new folders, and experiment. Like magic – a happy, healthy, beautiful folder tree will eventually emerge. 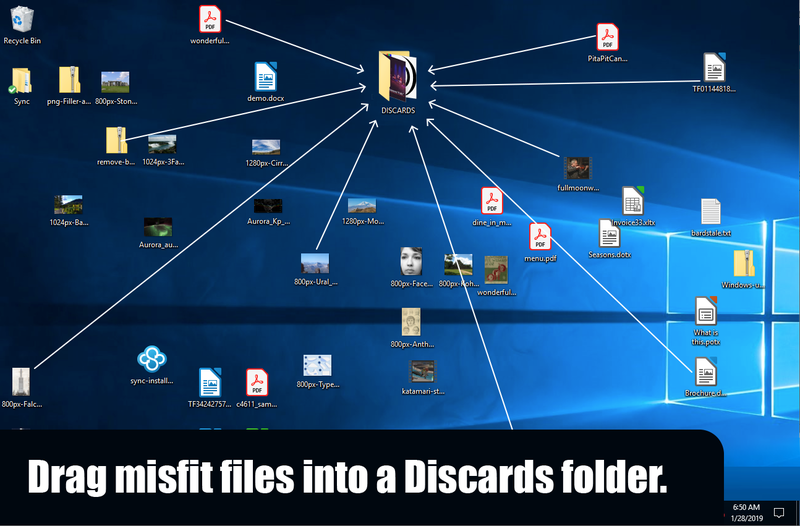 Don’t forget about your discards folder. Once you’ve got your home folder completely organized you can begin moving files from your discards folder, into their new home (or trash them completely). Forcing yourself to tidy up your discards pile is the final step to restoring order and balance in your life. Remember, every one of your old decrepit files did serve a purpose at some point in your life. As such, it’s important to thank each and every one of them, before tossing them to the trash. 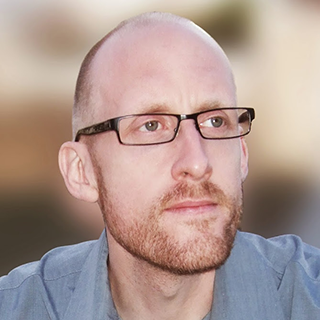 We should also thank tidying expert Marie Kondo, as this ritual of expressing gratitude when discarding is a key tenet of the KonMari method of decluttering. My own home folder is automatically synchronized to the cloud, which means that it’s always backed up. I don’t have to worry about accidentally deleting a file or folder, because I’ve always got a backup available. And the cloud makes sharing files and folders easy. The cloud will supercharge your clean and tidy prowess, and make your life even more sublime. Your real life starts again, only after you have put your files in order, and synchronized them to the cloud. What are you waiting for? It’s time to thrive!